My Theological worldview has undergone nothing short of a true paradigm shift over the past year. I traveled in Arminian/Semi-Pelagain circles for a number of years early in my Christian journey. As I grew in the faith, I had begun to become uncomfortable with this zeitgeist. It seemed that this system did little to foster true spiritual growth and seemed only to leave the faithful stunted, and bound in an insipid form of legalism. It was here that I began to consider theology rooted in the Augustinian/Reformed tradition. It is easy to believe that studying Reformed theology means reading only dusty old tomes written by dead guys. This could be the case unless you include R.C. Sproul in the equation. R.C. has written several works touching Reformed theology that are neither dull nor dusty. 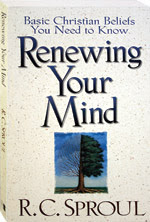 Most recently, I’ve completed “Renewing Your Mind” by R.C. This work examines the Apostle’s Creed, performing a phrase-by-phrase analysis of this historic “Statement of Faith”. “Renewing Your Mind” is a short read (220 pages) that was read on my recent flight to Phoenix and back. The book examines the solid scriptural underpinnings to the creed. Sproul’s work clearly portrayed the Apostle’s Creed as a universal “Statement of Faith” for any true Reformed Christian parish, congregation of fellowship. It falls squarely into my recommended book bag. Glad to hear it. I'm always surprised that so many Anglicans have the 39 Articles sitting there waiting for them and yet stay decidedly Arminian. Perhaps a rebirth of Anglicanism will include a return to the theology of Cranmer and Ryle.